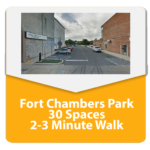 As more people travel into the heart of Chambersburg to worship at King Street Church, one challenge is a crowded parking lot. 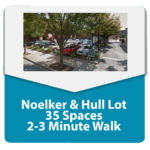 Blessedly, there are hundreds of available parking spots within a 5 minute walk, and not more than a block away. 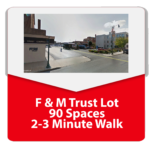 If you are able to park in an area other than main church and country courthouse lots, it would be a great help. This act of generosity will ensure that our guests feel welcomed which, in turn, provides us with new opportunities to engage and bless our community with the Gospel! 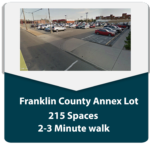 Featured lots outside the core lots (King Street main lot and the Franklin County Courthouse lots) – Click on one of the images at right for more detail. Parking%20KS from King Street Church on Vimeo.